Pseudomonas aeruginosa is a highly relevant opportunistic pathogen that causes disease in both animals and humans (Figure 1). It is typically found in soil, water, skin flora, and most man-made environments, since it requires minimal amounts of oxygen for growth, thereby allowing it to colonize a multitude of both natural and artificial environments. Like most species belonging to the bacteria family Pseudomonadaceae, P. aeruginosa measures 0.5 μm (micrometres) to 0.8 μm in length by 1.5 μm to 3.0 μm in width, and moves around using its single polar flagellum. Figure 1. 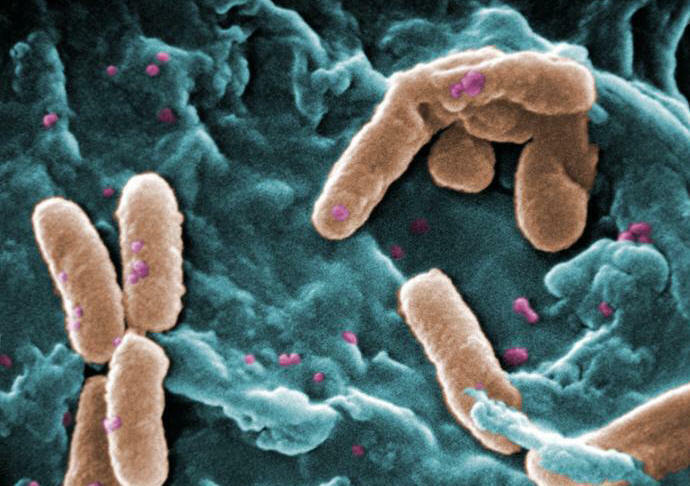 Scanning electron micrograph of Pseudomonas aeruginosa bacteria. P. aeruginosa is one of the fastest swimming microbes found in found water samples. Culturing this germ results in a production of colorless colonies that are unable to ferment lactose. Other identification factors include a fruity odour and the ability to grow at 42°C. P. aeruginosa is often referred to as an opportunistic pathogen because of its ability to take advantage of individuals with a weakened immune system. Even in healthy people, this germ can cause infections in critical body organs, such as the lungs, the urinary tract, kidneys, skin, bones and joints, and is often the cause of hot tub rash. The pathogen is of particular concern to people who with cystic fibrosis, patients who are immunocompromised (people with AIDS, leukemia, or cancer), and is the most common Gram-negative bacterium found in nosocomial or hospital-acquired infections. A full list of clinical infections caused by this species are mentioned further below. P. aeruginosa is infamously known for its ingenious mode of infection. Once this pathogen enters its host, it releases an exotoxin known as A-B toxin. This toxin is composed of two units, namely: A and B. Toxin B binds to the cell and is internalized; the A subunit, which is bound to the B subunit, has toxic activity and is also internalized (Figure 2). 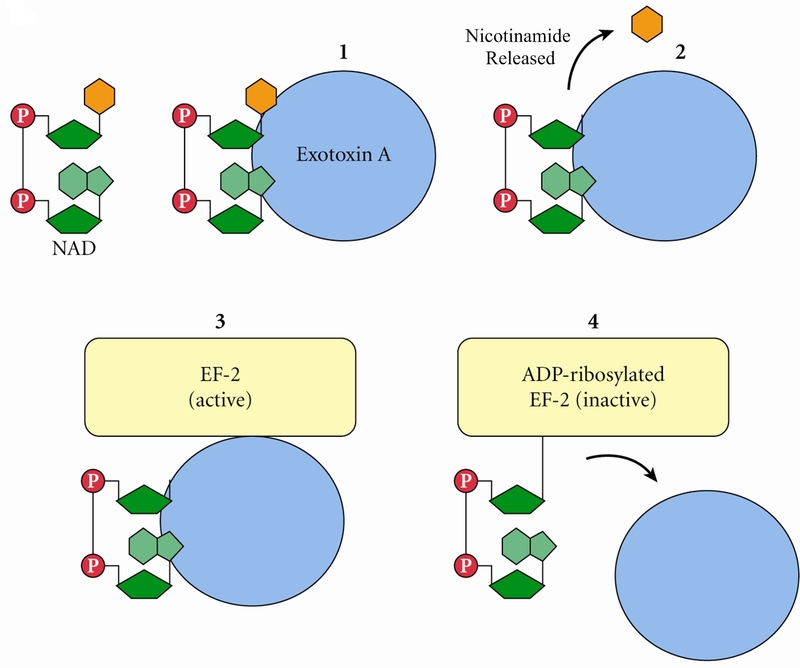 Exotoxin A then binds to a coenzyme inside the cell called nicotinamide adenine dinucleotide (NAD) (Figure 3); NAD is involved in many cellular oxidation-reduction reactions. The binding of exotoxin releases the nicotinamide from adenine dinucleotide (ADP-ribose). This ADP-ribose unit stays attached to the A subunit. Exotoxin A transfers ADP-ribose to Elongation Factor-2, a protein involved in the translation and elongation of proteins (Figure 3). This, in turn, blocks protein synthesis in host cells, causing damaging to target tissues. Another way P. aeruginosa evades the immune system is by producing specialized microbial factors that inactivate the complement cascade. Recall that the complement system is a biochemical cascade that helps or 'complements' the ability of antibodies to clear pathogens from an organism in innate immunity. 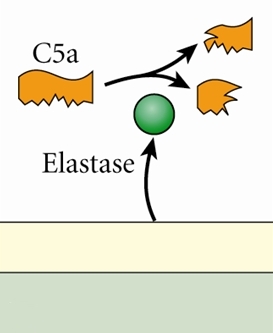 These enzymes known as elastases cleaves and destroys complement proteins, specifically C3a and C5a (Figure 4), resulting in a reduction in the local immune response to P. aeruginosa and favouring the establishment of infection (Pier et al., 2004). Figure 2. 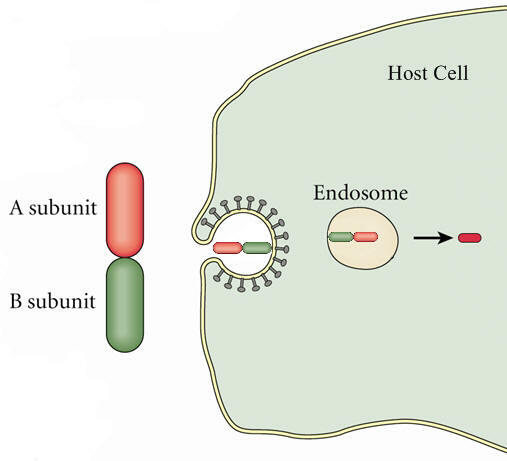 A-B toxin entry into host cell. Figure 3. Pseudomonas exotoxin A; ADP ribosylation of Elongation Factor 2 (EF-2) interferes with translation (translation process not shown). Figure 4. A schematic depicting elastase enzyme being secreted from P. aeruginos and breaking down C5a complement protein. Clinical Infections: P. aeruginosa is notorious for causing a number of clinical conditions. The organism is able to infect heart valves of intravenous drug users and prosthetic heart valves by establishing itself on the endocardium by direct invasion from the bloodstream, thereby causing endocarditis. Respiratory infections caused by P. aeruginosa occur almost exclusively in individuals with a compromised lower respiratory tract or a compromised systemic defense mechanism. Primary pneumonia occurs in patients with chronic lung disease and congestive heart failure. Lower respiratory tract colonization of cystic fibrosis patients by mucoid strains of P. aeruginosa is common and difficult, if not impossible, to treat. Moreover, P. aeruginosa causes bacteremia (presence of bacteria in the blood) primarily in immunocompromised patients. Most Pseudomonas bacteremia is acquired in hospitals and nursing homes. In fact, Pseudomonas accounts for about 25 percent of all hospital acquired Gram-negative bacteremias. P. aeruginosa also causes meningitis and brain abscesses. The organism invades the central nervous system from a contiguous structure such as the inner ear or paranasal sinus, or is inoculated directly by means of head trauma, surgery or invasive diagnostic procedures, or spreads from a distant site of infection such as the urinary tract. Urinary tract infections caused by P. aeruginosa are usually hospital-acquired and related to urinary tract catheterization, instrumentation or surgery. P. aeruginosa is the third leading cause of hospital-acquired urinary tract infections, accounting for about 12 percent of all infections of this type. The bacterium appears to be among the most adherent of common urinary pathogens to the bladder uroepithelium. Furthermore, P. aeruginosa is the predominant bacterial pathogen in some cases of external otitis including 'swimmer's ear'. The bacterium is infrequently found in the normal ear, but often inhabits the external auditory canal in association with injury, maceration, inflammation, or simply wet and humid conditions. P. aeruginosa can also cause devastating infections in the human eye. It is one of the most common causes of bacterial keratitis, and has been isolated as the etiologic agent of neonatal ophthalmia (inflammation of the eye). P. aeruginosa can colonize the ocular epithelium by means of a fimbrial attachment to sialic acid receptors. If the defenses of the environment are compromised in any way the bacterium can proliferate rapidly and, through the production of enzymes such as elastase, alkaline protease, and exotoxin A, cause a rapidly destructive infection that can lead to loss of the entire eye. P. aeruginosa has also been implicated in folliculitis and unmanageable forms of acne vulgaris. Treatment: Although antibiotics are relatively effective at treating P. aeruginos-related infections, including drugs such as gentamicin, tobramycin, colistin, and amikacin, most strains of P. aeruginosa are becoming increasingly resistant to these antibiotics. The combination of gentamicin and carbenicillin, however, is frequently used to treat severe Pseudomonas infections. Several types of vaccines are being tested, but none are currently available. Pier, G.B., Lyczak, J.B., & Wetzler, L.M. (2004). Immunology, Infection, and Immunity. Washington: ASM Press.